Until today, accepted wisdom said that all the walls were built by Herod. When we found these coins which were dated about 20 years after Herod’s death, we understood that it couldn’t have been him who built this part of the wall. This bit of archaeological information illustrates the fact that the construction of the Temple Mount walls and (the adjacent) Robinson’s Arch was an enormous project that lasted decades and was not completed during Herod’s lifetime. 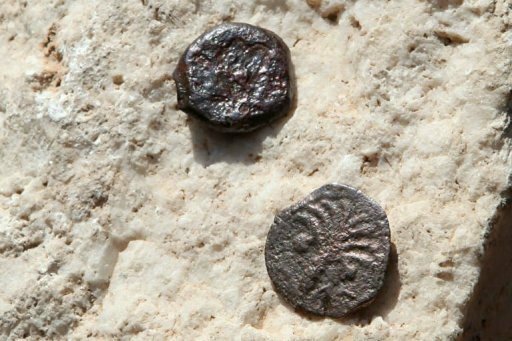 According to Israel Antiquities Authority, of the several coins found, the latest of them were struck by the Roman Prefect of Judea, Valerius Gratus, in the year 17/18 AD. By that time, Tiberius was emperor, and Jerusalem had been ruled by Roman governors for a decade. As construction could not have started before then, the coins may back up Josephus’s story that the wall was finished by Agrippa II, Herod’s great grandson. Or the building of the wall might have been much later by Hadrian, who rebuilt Jerusalem and made it into a gentile city called Ælia Capitolina. Josephus wrote that, when the work finally ended in 63 AD, 18,000 builders and masons were unemployed. To avoid trouble, Agrippa set them to paving the streets of Jerusalem. But it was only postponing the trouble, for soon the streets were paved, and again there was an army of tough men unemployed. According to Josephus, their agitation was important in bringing on the Jewish war against the Romans beginning in 66 AD, which led to the closure and partial demolition of the temple. 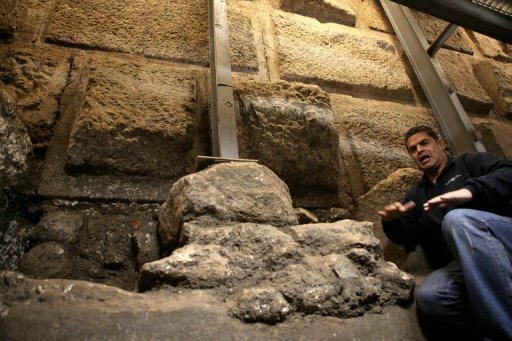 The mikveh and the coins were discovered metres from the Western Wall during controversial excavations of a 2,000 year old drainage channel which stretches from a site near the Western Wall and close to the Al-Aqsa mosque compound, the third holiest site in Islam and known to Moslems as Haram al-Sharif or the Noble Sanctuary. It then runs under the Old City walls to end in the Arab neighbourhood of Silwan. Jerusalem has been occupied by Israel since the 1967 Six Day War, so Palestinians consider excavations there as being an illegitimate and provocative desecration of a Moslem holy place. It further testifies to the importance of Jerusalem as a major city in the Late Bronze Age, long before its conquest by King David. One wonders immediately what sort of researchers these “researchers” were. They relate the supposed date of the find to the supposed time when the mythical king David mythically conquered Jerusalem, a tale which appears in the Jewish scriptures and nowhere else. These researchers are writers of fiction, citing fiction as evidence! And their fiction does not stop. Details of the discovery appear in the current issue of the Israel Exploration Journal . The clay fragment was uncovered recently during sifting of fill excavated from beneath a 10th century BC tower dating—apparently by pottery sherds—from the period of King Solomon in the Ophel area, located between the southern wall of the Old City of Jerusalem and the City of David to its south. Having used the mythical David, they now refer to his mythical son, Solomon, speaking of the “period of King Solomon” as if they had certain sure evidence that king Solomon existed in some period that they have now allegedly found a tower in. There is not an iota of evidence that Solomon ever existed even has a “kernel of truth”, a phrase these professional biblical myth defenders often use to defend shabby evidence and argument. It is like speaking of Hadrian’s Wall as being of the time of king Arthur. The chief propagator of this pathetic excuse for scholarship is one Dr Eilat Mazar of the Hebrew University Institute of Archaeology. She has conducted the excavations in the Ophel with funds provided by Daniel Mintz and Meredith Berkman of New York, who also have provided funds for completion of the excavations and opening of the site to the public by the Israel Antiquities Authority, in cooperation with the Israel Nature and Parks Authority and the Company for the Development of East Jerusalem. The sifting work was led by Dr Gabriel Barkay and Zachi Zweig at the Emek Zurim wet sieving facility site. Needless to say Zionist blogs, Christian blogs and Neoconservative blogs all over the internet have been citing this as “proof” that Jerusalem always belonged to “the Jews”. Even a tyro scholar as opposed to a Hebrew University “scholar” knows there were no Jews until the Persians set up the satrapy of Abarnahara, and colonized Jerusalem with people from elsewhere who were thereafter called Jews or Yehudim. The people who lived in the area of Jerusalem in the 14th century were either Egyptians or were Canaanite puppet Lords, as the press release admits a few paragraphs later. The fragment that has been found is only 2 x 2.8 x 1 centimeters in dimensions. Dated to the 14th century BC, it appears to have been part of a tablet and contains cuneiform symbols in ancient Akkadian, an eastern Semitic dialect, described as the lingua franca of that time, presumably because it was the language of the around 380 El Amarna tablets found in Egypt in the 19th century. It is believed to be contemporary with these tablets which were the archives of Pharaoh Amenhote IV—Akhenaten—who lived in the 14th century BC. The El Amarna archives include tablets sent to Akhenaten by the kings who were subservient to him in Canaan and Syria and include details about the complex relationships between them, covering many facets of governance and society. Among these tablets are six that are addressed from Abdi-Heba, the Canaanite ruler of Jerusalem. Note, not a Jew! Not an Israelite either, if we use the source favored by these scholars, the Jewish scriptures. The Israelites came later, around the twelfth century as far as can be made out from the bible. The tablet fragment in Jerusalem is most likely part of a message that would have been sent from the king of Jerusalem, possibly Abdi-Heba, back to Egypt, said Mazar. Effectively, she is admitting that the Israelites were Canaanites, not Jews, and Canaanites were polytheistic, not monotheistic worshipers of the Yehouah allegedly introduced by Moses. Tablets with diplomatic messages were routinely exchanged between kings in the ancient Near East, Prof Wayne Horowitz, a scholar of Assyriology at the Hebrew University Institute of Archaeology, said, and it is likely, because of its fine script and the fact it was discovered adjacent to in the acropolis area of the ancient city, that the fragment was part of such a royal missive. Horowitz has interpreted the symbols on the fragment to include the words “you”, “you were”, “later”, “to do”, and “them”. The words the symbols form are not significant in themselves, but what is significant is that the script is of a high level, testifying to the fact that it was written by a skilled scribe who probably worked for the royal household of the time, said Horowitz. He and his former graduate student Dr Takayoshi Oshima, now of the University of Leipzig, Germany, deciphered the script. In the mixed and confusing messages these mythologizers are putting over, we are now being assured that Jerusalem had Jewish kings before there were Jews or even Israelites around. The kings were vassals of the Egyptian king. Palestine was an Egyptian colony. They were not David or Solomon, or even Saul, who has not so far been mentioned, perhaps because he was a failure, and got kicked out by God who preferred David in the biblical myth. Zionists are not fond of Jews who failed, even mythical ones. 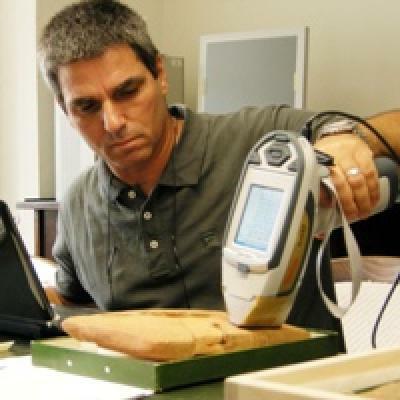 Examination of the material of the fragment by Prof Yuval Goren of Tel Aviv University, shows that it is from the soil of the Jerusalem area and not similar to materials from other areas, further testifying to the likelihood that it was part of a tablet from a royal archive in Jerusalem containing copies of tablets sent by the king of Jerusalem to Pharaoh Akhenaten in Egypt. It must have been a primitive carbon copy then! Maybe the original will turn up at El Amarna? Mazar says this new discovery, providing solid evidence of the importance of Jerusalem during the Late Bronze Age—the second half of the second century BC—acts as a counterpoint to some who have used the lack of substantial archeological findings from that period until now to argue that Jerusalem was not a major center during that period. It also lends weight to the importance that accrued to the city in later times, leading up to its conquest by King David in the 10th century BC. Ho hum, tiddly dabe! All mimsy were the borogoves, and the mome raths outgrabe. Here we are back at king David again. What is major to a Zionist Israeli—many of whom now are Slavs—is not major to most other people. They accept from the El Amarna tablets that there was a Jerusalem (almost!) and some minor local lord administered it for the pharaoh. He might have raised sheep or slaves for the mother country along the Nile, so it was important to him, and of some importance to the Pharaoh. It has as much bearing on modern day Jews or even Israelis as the discoveries in Boghazkoy have for modern Turks. None! By force of arms, they now merely live where the discoveries were made. Mainly, they are different people.